First up, I'm calling this a peanut butter poke cake, but I didn't actually use peanut butter. However, "chocolate and substitute peanut butter poke cake" doesn't have quite the same ring to it. And this tastes like peanut butter, so it's what people would think when you serve it. But first, about the cake. I had the urge to make this cake for quite some time. It started with a photo of a chocolate poke cake. But then I thought, gee, peanut butter would be fun. 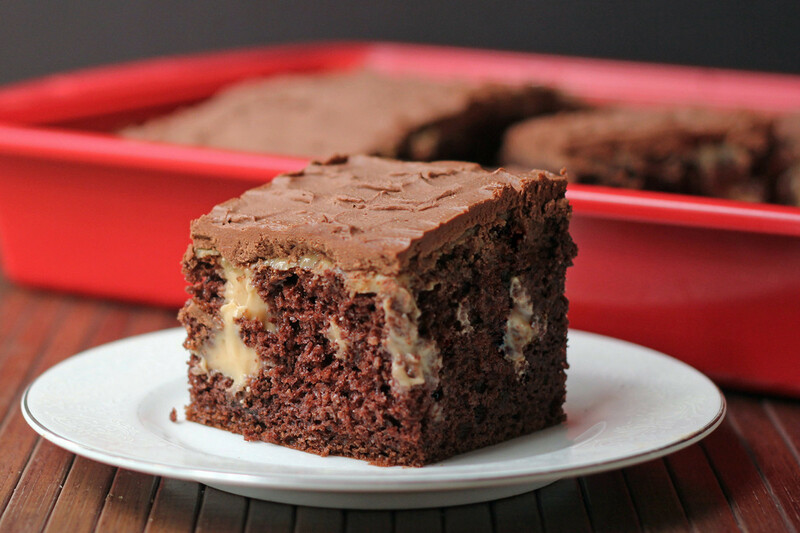 I love chocolate with peanut butter. But trying to shove plain peanut butter into the holes of a poke cake probably wouldn't be successful. So then I decided that I needed to make a peanut butter pudding. That's something I've never made before, but it certainly seemed worth a try. But! For the peanut butter, I used WowButter, which is a non-peanut, safe-for-schools product. There are more and more nut-free butters out there, which is a great thing for kids with allergies. This one is made from toasted soy nuts. I used to buy toasted soy nuts as a snack, and the WowButter has a similar flavor when you taste it on its own. It has a nutty flavor without tasting like a specific nut. But the toasted flavor is a little more prominent than what I've noticed in standard peanut butters. It's a really nice toastiness. But when the WowButter was used to make peanut butter pudding and then added to cake, I think most folks would just assume it's a nut butter. And that's a good thing. 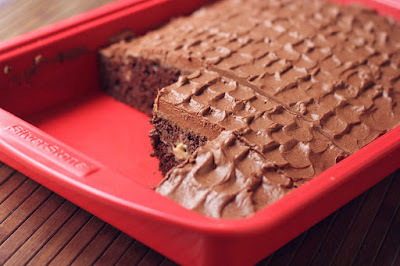 For this particular cake, I used a box mix, but you could certainly use any chocolate cake recipe you like, as long as it's enough to fill a 9x13 pan. 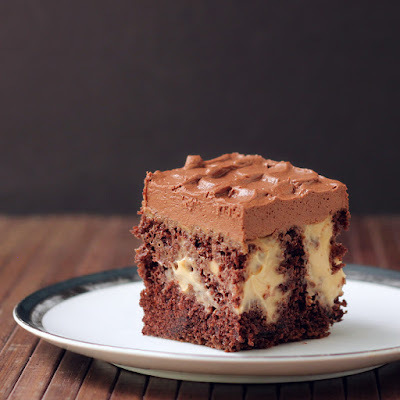 Or you could make a smaller cake and use less pudding, like this wacky cake. Another smaller cake is Midnight chocolate cake, which is a little denser, and also very good. The cake and pudding should be warm when they meet each other, so make the cake first, and start making the pudding while the cake is baking. You can take your time making the pudding, and if the cake isn't done when you're finished with the pudding, you can gently re-warm it. Put the sugar, salt, and cornstarch in a heavy-bottomed saucepan and whisk to combine and break up any lumps. dd the cold milk and stir to combine, making sure there are no clumps of cornstarch. Heat the mixture on medium heat until it thickens to coat the back of a spoon. Add the WowButter and stir to combine. This mixture needs to be thick enough to turn into pudding when it has cooled, but it also need to be thin enough to pour and seep into the holes you'll form in the cake. If it's too thick, you can add a little more milk to thin it to a pouring consistency. Use the handle of a wooden spoon (or any implement of a similar size) to poke holes in the still-warm cake. I didn't count the number of holes, but you do want to make sure you have multiple holes per slice of cake. Pour or spoon the pudding onto the cake, focusing on getting it into the holes in the cake. Make sure the pudding is going down into the holes and not just forming a pudding bubble above an empty hole. You can use a skewer to make sure the pudding is settling into the hole. If you have a significant amount of pudding left, you can poke more holes into the cake and add more pudding. Let the cake cool, then refrigerate it until it is chilled. This is simple to make in a stand mixer, but you can also make it in a bowl with a hand mixer. Make the ganache after the cake is cool, and just before you want to frost. My favorite 9x13 pan from Silverstone. Put the chocolate into the bowl of your stand mixer fitting with the whipping attachment. Heat the cream until it is simmering. Add it to the chocolate. With the mixer on low speed, "stir" the mixture until the chocolate is fully melted. Stop the mixer and use a spatula to make sure there are no lumps of chocolate stuck to the bottom or sides of the bowl. Turn the mixer speed up a notch or two and continue mixing. This will help the chocolate cool a little faster. If you're using a bowl and hand mixer, it's probably easier to just let it cool rather than stand there mixing. When the chocolate is cool, it will begin to thicken. Turn the mixing speed up and continue beating until the frosting is as light and fluffy as you like. Remove the cake from the refrigerator. If there are pools of pudding on top, scrape or spoon the pudding off - it will make the frosting harder to spread if there's a thick layer on top. Frost the cake. You can serve the cake immediately, or refrigerate to serve later. The ganache will get firmer when it is chilled. Keep any leftover cake refrigerated. 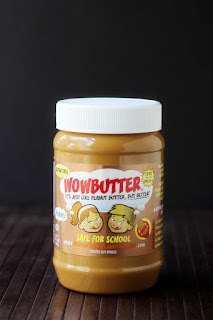 I received the WowButter at no cost to me as a sample; I wasn't required to use it in a recipe.